After seeing these newcomers, I just couldn’t not pick them all up to do a comparison of sorts. Ingredients: Apple Cider, Sugar, Hops, Potassium Sorbate. The Nose: WEEEIRD. Not bad. Just, unlike any other cider (SO FAR!!?!). You can definitely smell the hops (which I like). Light, sort of floral, hoppy, vaguely sweet. It smells fresh but not crisp. Smells like the mountains in summer. The Colour: Very pale, green-y yellow. A little hazy. The Mouthfeel: Barely discernable carbonation– this usually is a non-starter for me, but taken into consideration with the flavour I actually think this serves the cider well. Not heavy or sticky. I can barely discern any residual film (in muh mouth or in muh glass). The Taste: Sweet. Then a soupcon of bitterness which gives way to a tart … beerness? It’s my understanding of dry hopping that the additions don’t add a tonne to flavour so much as aroma, but I definitely do pick up a hop presence in the taste. If I had to interpret the drinking experience in broad strokes: lightly sharp and then very round. Does that make sense? Maybe not! But you’re reading my words by choice so what does that say about you?! Haha. Sucker. The Verdict: Verra nice. The hops are well balanced and feel necessary (particularly because of the sweetness). That said, the cider isn’t so sweet that I couldn’t see drinking several in one session (*cough*I have already*cough*). I’m pleased with all aspects of the cider and yet it didn’t knock my socks off. It’s lovely and well-balanced but not interesting. I’m not sure what’s missing (if, in truth, anything is), but I wasn’t “wow-ed”. I would absolutely recommend it, though. Overall: 7.5/10. *Dry hopping simply means adding some dry hops to a cooled brew/cider/liquid to enhance the aroma. The hop pellets are added and allowed to soak to infuse the aforementioned bevvie. 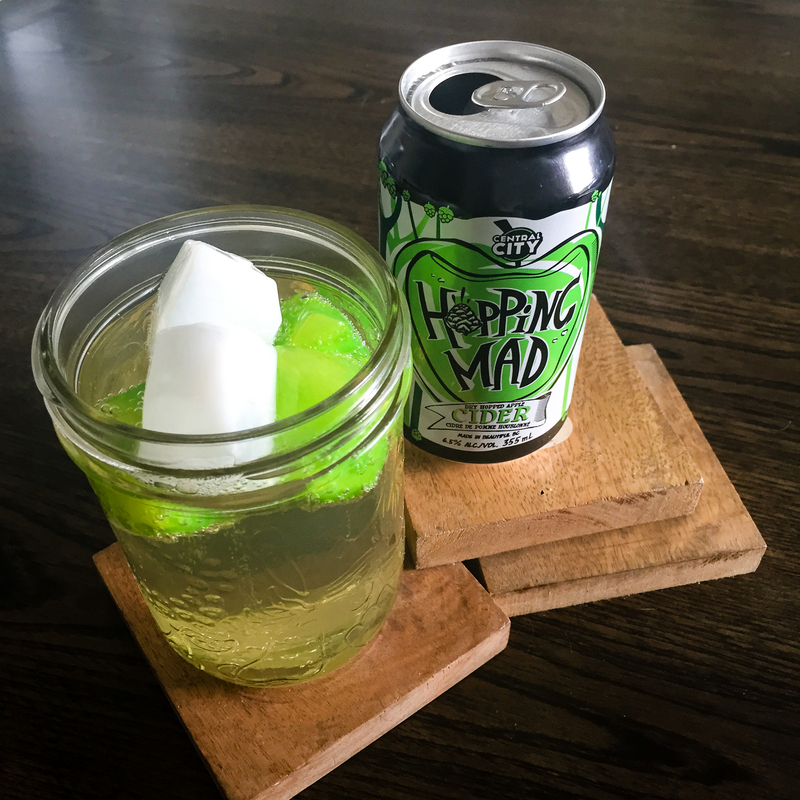 Have you tried Central City’s Hopping Mad Cider? What would you rate it? Tell me about your experience with it below in the comments. This entry was posted in Cider Review and tagged Apple Cider, British Columbia, Canada, Canadian Cider, Central City, Cider, Cider Review, Dry Cider, Dry Hopped, Hard Cider, Hopped Cider. Bookmark the permalink. Love it, I do not usually like cider and I am not that much of a beer drinker but this combo is great. Very refreshing, not sweet (which is what I did not like about other ciders) and not acidic tasting like some ciders. We have tried one of the competitors produced in the Okanagan, where we live, and would like to support them but the hop flavour is too weak and the balance seems too apple flavoured. Nice alternative to white wine, beer or other ciders. Thanks for producing it!